Subhan’Allah, as Muslims, we recite the Adhan into the ears of our children as soon as they are born so that the first words they hear are those of Islam. As our children grow up, it is our duty to educate our children about Islam; but we must do so with so with love and kindness. Our goal should be to teach our children about our religion, in a loving matter, and in a way that will create righteous children. Furthermore, our objective should be to show our children that Islam has all the answers, and within Islam you will find peace. 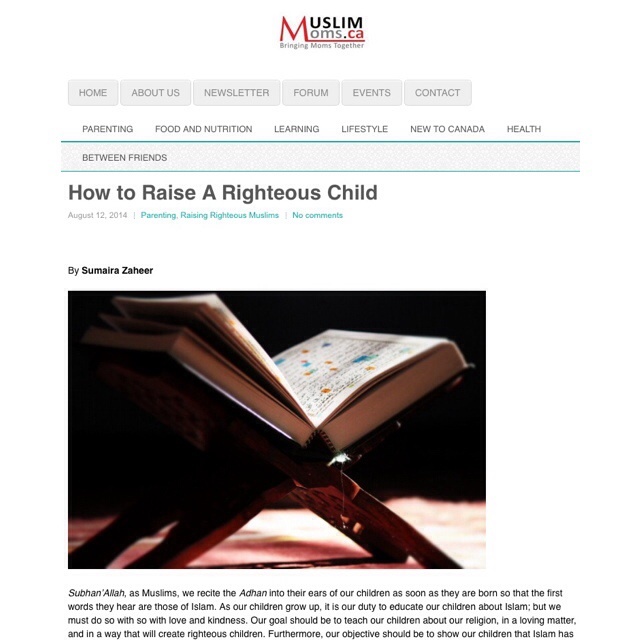 The following are five key tips to keep in mind when bringing up our children as righteous Muslims. Our children need to have the knowledge and understanding of the five pillars of Islam, for it is this very knowledge that will provide a foundation for our children’s lives. Declaration of Faith (Shahadah) – The belief that there is only one God (Allah) , and Muhammad (may peace be upon him) is his messenger. Prayer (Salaah) – As Muslims we are obligated to pray five times a day: Fajr, Zuhr, Asr, Maghrib, and Isha. Charity (Zakah) – We must give a percentage of our wealth to the needy and less fortunate. Fasting (Sawm) – Fasting in the month of Ramadan is obligatory for all healthy Muslims. Pilgrimage (Hajj) – Hajj is the pilgrimage to Makkah made by Muslims that are financially and physically able to do so. It is our duty as parents to teach our children that Islam plays a huge role in our daily lives; we must speak, eat, dress, and act in an Islamic matter. For instance, as Muslims we should try to say Alhumdulillah, Masha’Allah, and Insha’Allah whenever it is appropriate; and we must eat with our right hand, and drink sitting down in addition to eating halal foods and abstaining from haram foods. We must also take care to dress modestly, and talk to others in a respectful manner. It is important to teach our children how to read the Holy Quran at an early age, for the younger the children are, the easier it will be for them to learn the Arabic alphabet. In addition, we should strive to teach our children to read with Tajweed; if you feel as if you are not able to give your child proper instructions on how to do this, you can contact your local mosque to enquire about Quran classes. Equally important, is teaching our children the meaning of what is written in the Holy Quran, for when we read the Quran while knowing the meaning it brings peace to our hearts and soul. Once children learn how to read the Quran, they will be able to memorize how to pray Salaat. Before that, we should make it a habit to have our children pray with us, or at least observe us in prayer. We need to teach our children that praying is an act of worship; they should also know that when we make dua at the end of our daily prayers, we are asking for forgiveness and seeking guidance from Allah SWT. All these things are rendered ineffective if we do not practice them ourselves. We will be our children’s first role models; therefore our children will learn most, if not all, of their habits from us. We must be aware of our actions, and take note of how we are behaving in front of our children. We must practice ahsan Islamic behaviour if want our children to become righteous children. If we practise Islam from our hearts, insha’Allah our children will too. MashaAllah!! congrats for another great article!! Excellent. Good advice. I firmly believe in being your child’s role model.